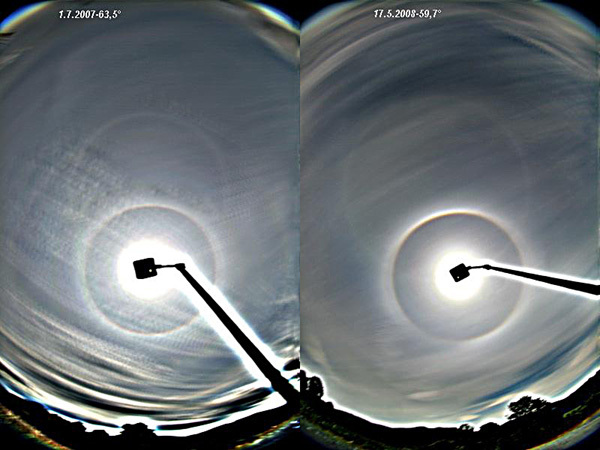 In the evening of 15th May Bernard Hulshof witnessed a fine halo display in Agios Gordis on the Greek island Corfu (composition of Bernard's photos above). The display was dominated by pyramidal crystal halos including 9° and 24° plate and column arcs ( 1 ). 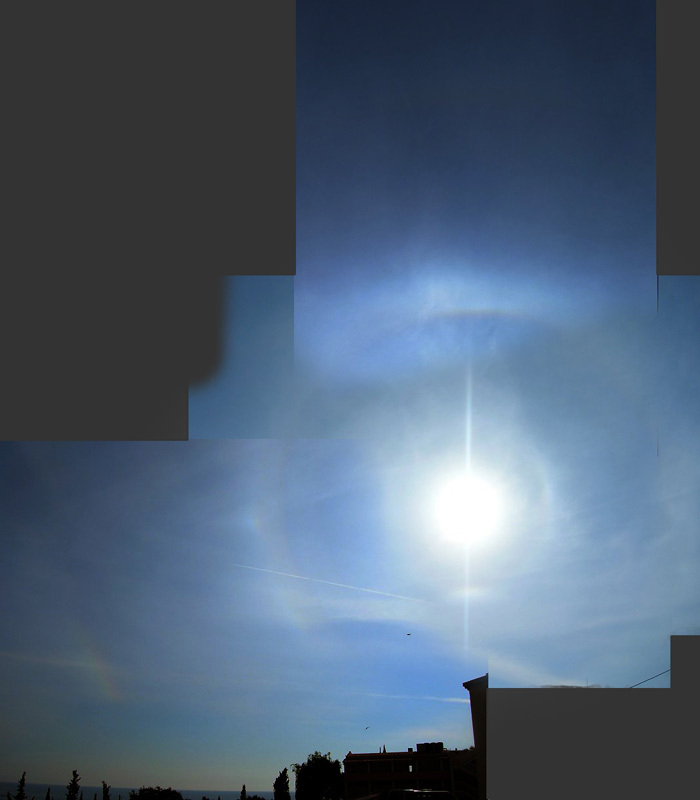 Additionally 9°, 18°, 20° and 24° halos and perhaps a 23° upper plate arc can be seen in the photos. The column arcs are not very well defined indicating large tilting angles of the crystals. The large tilting angles are responsible for the column arcs spreading and forming a circular halo -type of appearence. 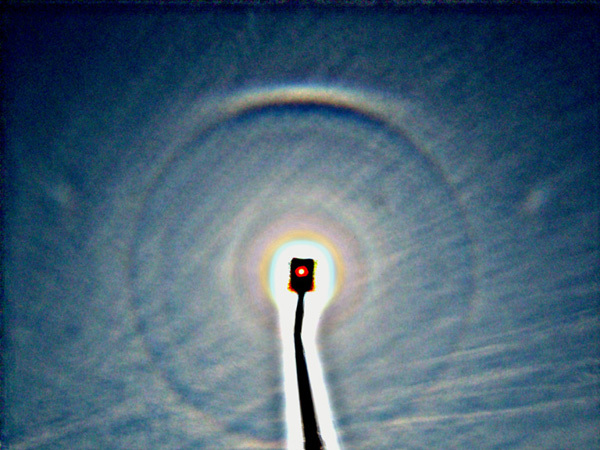 Next day, 16th May, Ágnes Kiricsi saw a short-lived 9° halo in Vecsés, Hungary ( 2 ). After the pyramidal stuff was gone, a circumscribed halo delighted Ágnes for a long period of time. 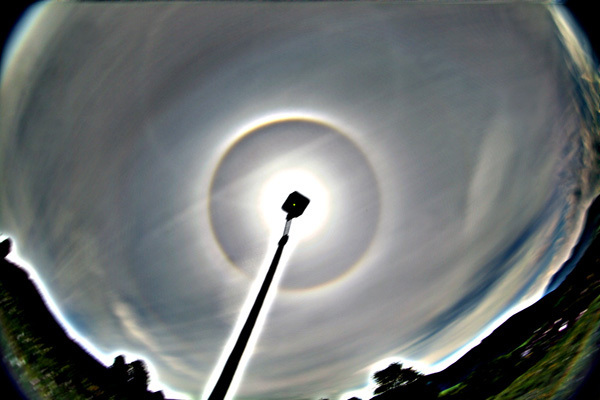 The centre of the action moved to Czech Republic, where on 17th May good halo displays were seen in Holesov by Patrik Trncak and in Nýdek by Martin Popek. Patrik's display was an odd-radii one with 9° and 18° halos and a 23° upper plate arc (61 stacked photos enhanced with an unsharp mask 3 ). Martin's display was dominated by column crystal halos (without pyramidal ends) ( 4 - 5 ). 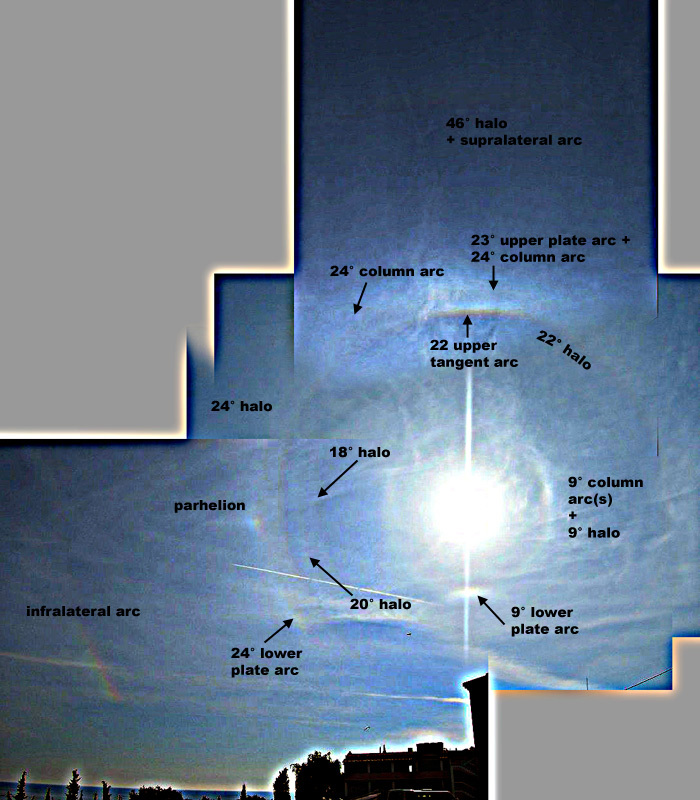 Notice how in the leftmost photo in link "4" the 46° halo is very close to the anthelic point. Wow nice odd radius stuff. The 9 degree plate arc shows its true are shape quite well. Looks like there may be trace of 35d halo between 24 and 46 halos. I agree, the 9 degree plate arc is beautiful!